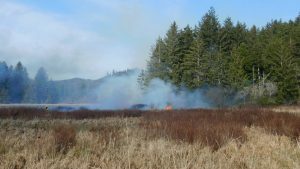 Just days before Spring Break on Wednesday evening, March 20th, Nehalem Bay Fire & Rescue responded to a brush fire that had gotten out of control. 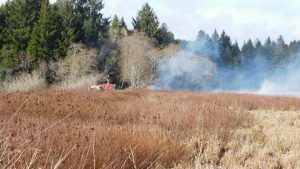 The homeowner had a burn permit and was burning a brush pile on the edge of a swamp area. “A gust of wind and the fire quickly spread out of control,” said the property owner. “It happened so fast.” And fortunately, NBF&R’s main station is less than 1/2 a mile from the fire location and arrived with a variety of equipment and personnel to quickly contain and extinguish the fire. Even near water, in the land of many waters, rainfall has been lighter and less in northwest Oregon this Winter. The local volunteer fire departments want to remind residents and visitors about fire safety as we embark on “outdoor” fire season. – Burn permits are REQUIRED for brush piles, burn barrels, etc. 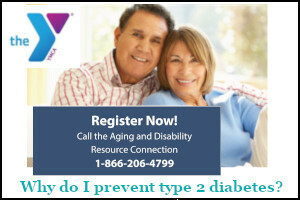 Check with your local fire department for more information. – When burning a brush pile, be sure to clear other debris from the area and do not burn on a windy day. – Always have a water source to be able to extinguish the fire. – BEACH FIRES — REMEMBER, DO NOT START FIRES IN DRIFTWOOD PILES. 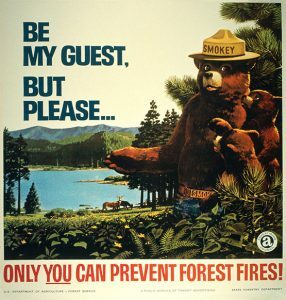 Beach fires need to be 50 feet from any vegetation, beach grass, etc. – Be sure to completely extinguish your beach fire with WATER. DO NOT BURY THE FIRE or attempt to put it out with sand. There have been tragic accidents when these fires are “unburied” by children digging, resulting in serious burns. Many local visitors centers have fire extinguish kits, buckets, etc. – Camping out – fires are only allowed in designated fire pits or rings. – Know what the current regulations and restrictions are for fires, as they change throughout the season.